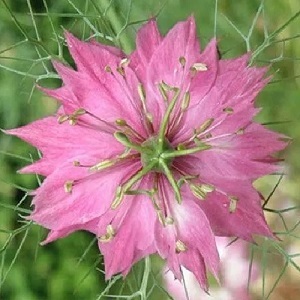 A heritage variety of Love-in-a-Mist with pale pink flowers from July to August/September. Nigella is a tall hardy annual, growing on strong stems in groups or gaps in a border, to a height of 50cm. Nigella makes a good cut and dried flower. Plants have decorative seedheads in winter.